Jayant M, Goel R, Nadkarni N, Dalal AK. Salvage Surgery in Endoscopic Era. Oman Med J 2011 Jul; 26(6). Keywords: Unusual complication; Endoscopic Retrograde Cholangiopancreaticography. 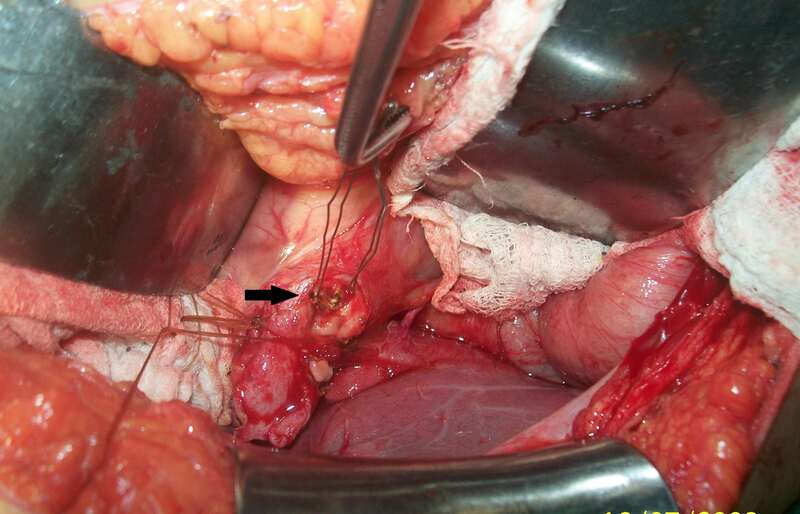 In today’s era of endoscopic and minimally invasive procedures, Endoscopic Retrograde Cholangiopancreaticography (ERCP) is the predominant method of treating Common bile duct (CBD) stones.1,2 But this procedure is not free from complications like bleeding, pancreatitis, and perforation, amongst others.3 This report presents an uncommon complication of ERCP which required emergency rescue surgery. A 35 years old female with cholelithiasis and choledocholithiasis was referred to the Gastroenterology department for ERCP and clearance of her CBD. She had a single stone measuring approximately 1.5 cm in distal CBD on Cholangiogram. Endoscopic Sphicterotomy was done and the stone was engaged in the dormia basket. But on pulling the basket, it got stuck at the ampulla. Several attempts to pull the basket were futile and disengagement of the dormia basket failed as the stone became impacted in the wires of the basket. Sphicterotomy was extended and retrieval of the basket was attempted but failed. The facilities for mechanical or extracorporeal shock wave lithotripsy were unavailable at our institute, thus a laparatomy with CBD exploration was planned. On exploring the bile duct, the basket was strongly adhered to the substance of the stone and impacted at the ampulla (Fig. 1). The wire was cut and the dormia basket along with the stone was removed (Fig. 2). The bile duct was explored for the presence of any other stone and closed over a T-tube. The patient had an uneventful post operative period and the T-tube was removed on the 14th day after a normal T-tube cholangiogram. In the reported patient, extended sphincterotomy failed and lack of mechanical or extracorporeal lithotripsy forced us to resort to Common Bile duct Exploration with successful outcome. The authors reported no conflict of interest and no funding was reported on this work. 1. Neuhaus H. Endoscopic and percutaneous treatment of difficult bile duct stones. Endoscopy 2003 Aug;35(8):S31-S34. 2. Maple JT, Baron TH. 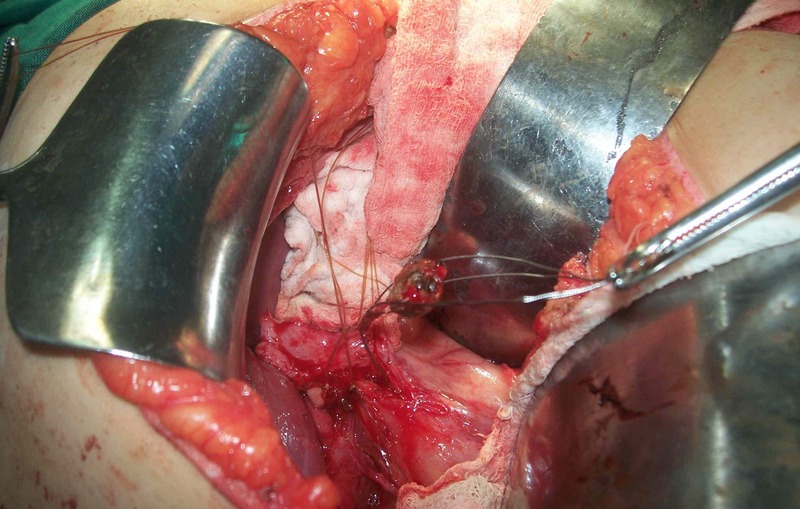 Biliary-basket impaction complicated by in vivo traction-wire fracture: report of a novel management approach. Gastrointest Endosc 2006 Dec;64(6):1031-1033. 3. Sezgin O, Tezel A, Sahin B. Dormia basket fracture: an unusual complication of mechanical lithotripsy. J Clin Gastroenterol 2000 Mar;30(2):215. 4. Ranjeev P, Goh K. Retrieval of an impacted Dormia basket and stone in situ using a novel method. Gastrointest Endosc 2000 Apr;51(4 Pt 1):504-506. 5. Sauter G, Sackmann M, Holl J, Pauletzki J, Sauerbruch T, Paumgartner G. Dormia baskets impacted in the bile duct: release by extracorporeal shock-wave lithotripsy. Endoscopy 1995 Jun;27(5):384-387. 6. Mutignani M, Gabbrielli A, Murali N, Perri V, Costamagna G. Novel methods of management of trapped dormia baskets in the pancreatic and biliary ducts. Endoscopy 1997 Feb;29(2):129-130. 7. Filiz AI, Sucullu I, Aydin Y, Kurt Y. Biliary basket impaction - a rare complication of ERCP: report of a case. Gulhane Tip Dergisi 2009;51:254-255. 8. Attila T, May GR, Kortan P. Non surgical management of an impacted mechanical lithotripter with fracrure wire: Endoscopic intracorporeal electrohydraulic shock wave lithotripsy followed bt extra-endoscopic mechanical lithotripsy. Can J Gastroenterol 2009;22:699-702. 9. Ng EK, Lau JY, Chung SC, Li AK. Retrieval of an impacted lithotripsy basket. Endoscopy 1997;29:883-885 . 10. Neuhaus H, Hoffmann W, Classen M. Endoscopic laser lithotripsy with an automatic stone recognition system for basket impaction in the common bile duct. Endoscopy 1992 Aug;24(6):596-599. 11. Katsinelos P, Germanidis G, Chatzimavroudis G, Pilpilidis I, Zavos C, Kountouras J. Biliary sphincter dilation: a novel approach for management of a biliary basket impaction. Endoscopy 2008 Nov;40(11):958, author reply 958.